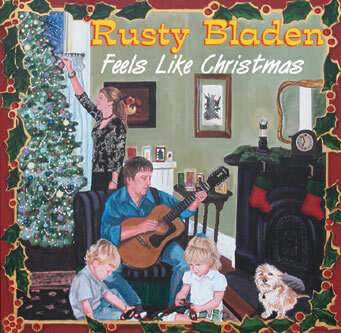 Those who’ve seen Rusty Bladen live already know how down-to-earth yet so exciting his shows are. Rusty Bladen’s music can absolutely light up a room. This CD reinforces that fact. It’s a Countryfried Homegrown Rock & Roll Christmas Party Music. The title track is a Rusty Bladen original. The other 12 songs are roots-rock versions of favorite traditional Holiday songs. Listen to all the tracks below, and click the green BUY ALBUM button to purchase MP3 versions. Here’s a link to listen/buy on iTunes. This album has something for everyone, Rock, Folk, Gospel, Country and Pop; it is a Christmas rock and roll knockout punch.